Cut first two wing joints off quail. Combine garlic, lemon zest, canola oil and parsley. Rub each quail with mixture. Combine flour, egg and water in food processor. Pulse until well combined. Transfer into stainless steel bowl and knead for at least 10 minutes. Add more water in very small additions if dough seems dry. Season pork belly with salt and pepper and marinade overnight or at least 6 hours. In a baking dish combine pork belly, rose and chicken stock. Cover with foil and roast at 350°F until pork is very tender. Strain off and de-fat liquid. Add preserved lemon juice to liquid and reduce until syrup consistency. Turn oven up to 450°F and cook belly uncovered until browned on both sides. On a cutting board pick apart and separate lean meat, crispy bits and fat. Rough chop lean meat. In a food processor combine reserved crispy bits, fat and levain. Process into a smooth paste. In a bowl combine lean meat, puree, cooking liquid reduction, Parmesan, and parsley. Mix thoroughly. Separate cranberry beans and black eyed peas into two separate pots. Add 1 shallot and 1/2 a sprig of rosemary to each pot. Cover with water and simmer until beans are very tender. Season with salt and let cool in cooking liquid. Cook green beans in heavily salted water. Shock in ice water. Combine roasted garlic and chicken broth. Reduce to about one cup and season with salt, lemon juice and honey. Strain through fine sieve. Roll pasta to thinnest setting on pasta rolling machine. Cut pasta into 4-inch squares. Place a teaspoon of the filling just off the center of each square. Brush corners of pasta with water. Fold pasta into triangle shape and seal. Season each quail with salt and pepper. Sear on a very hot stainless steel flat-top. Place a weight on each quail to help it retain its shape. Cook quail to medium to medium-well. Warm equal parts green beans, shelling beans and blackeyed peas in the chicken broth. Drop ravioli in lightly salted water and cook until pasta is soft, not toothsome. Add cooked ravioli to bean mixture. In a bowl place about a 1/4 cup of the bean mixture and two ravioli. 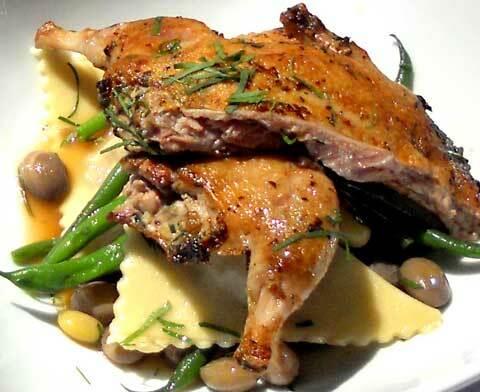 Cut quail in half and place on top of beans. Spoon extra broth over each quail. Garnish with chiffonade of parsley.